I once had a great, large tote. I used it often. After a while grime and grease from toting leftovers rendered the tote too gross to use (despite attempts to launder of course). I finally parted with the bag but I saved the hardware (handles, shoulder strap, d-rings) with the intention of re-creating it. A year or so later and 2 days before leaving for a trip to Argentina I decided, now is the time! After the jump, illustrations and walk-through galore! Here's another look at the tote. 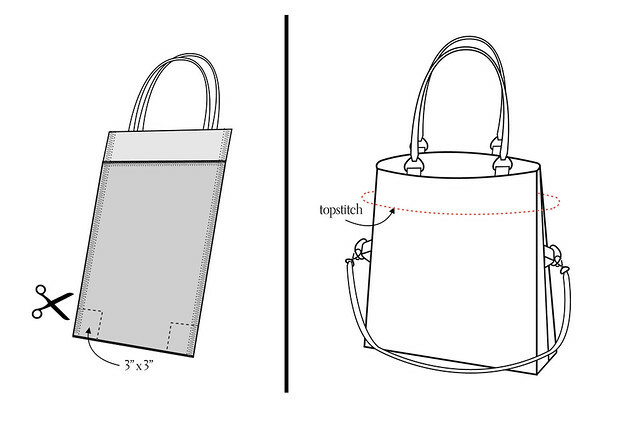 It's a large tote with handles at the top so that you can tote it or put it on your shoulder. A third of the way down are d-rings so that you can attach a strap. 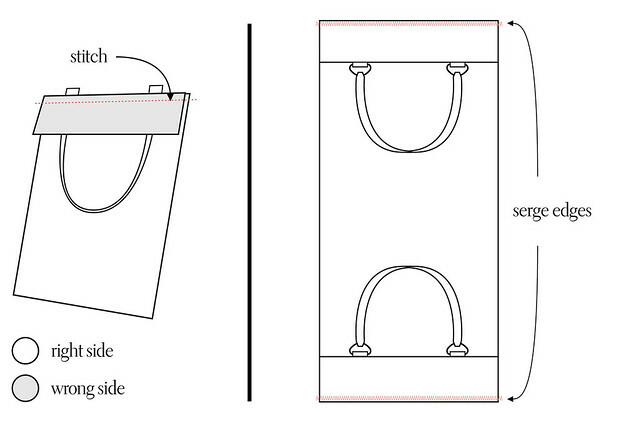 The top third of the bag folds over and you can cary the bag over your shoulder/chest like a messenger. I'm being intentially vauge on some of the dimensions in the post, I'll leave it up to you to decide how large you want to make your bag. Mine is fairly large (which makes it great for a plane carry-on bag and for biking around with my computer and layers of clothing as is appropriate in San Francisco). The tutorial explains the elements and construction. 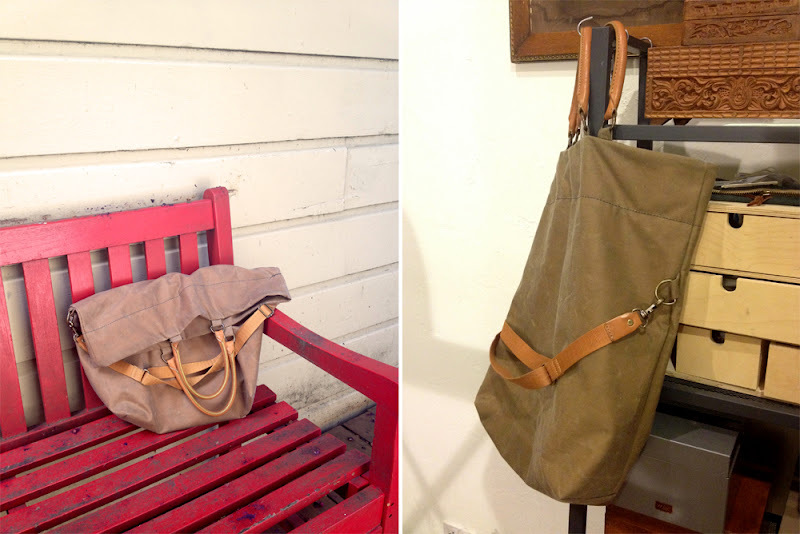 For the exterior, I used a medium-weight waxed cotton. It's gorgeous! For the interior, I used a basic cotton calico. To stitch waxed cotton I used a heavy-weight fabric sized needle in my machine and nylon upholstery thread, in black. 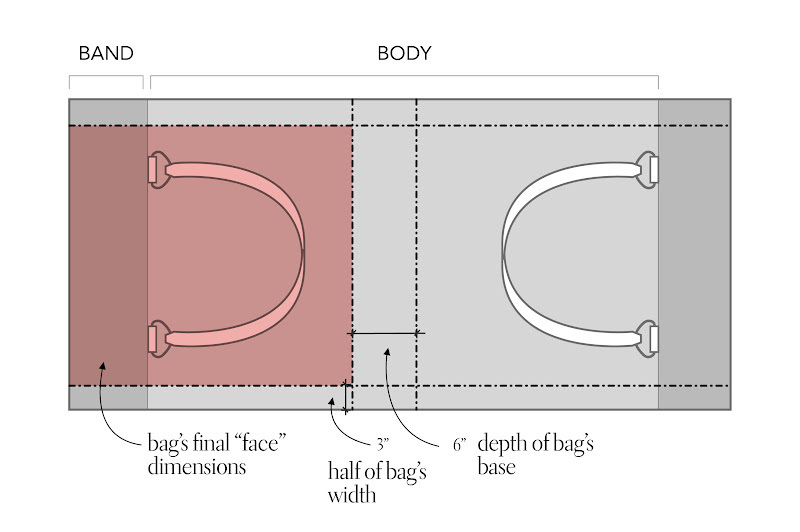 The diagram above illustrates the elements of the bag. When you determine the dimensions you want for the face (pink area) to be, you can generate from that the size of fabric to cut. WIDTH = body "face" width + 6". Your band width should be the same. 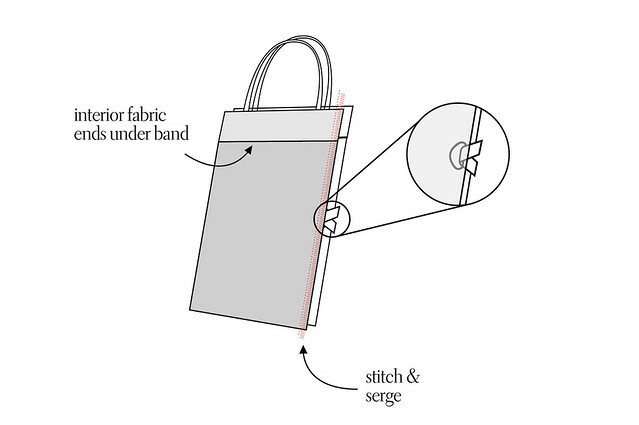 Your interior fabric should be the same dimensions of the bag, minus the band. It will sit under the band on the inside. Make 6 pieces of fabric to be your loops to hold on the d-rings. To do this, measure the flat side of your d-ring (approx. 1" in my case) and double that number, then add on 1/2" for seam allowance. That will serve as your width. Make it at least 24" long. You should have a long rectangle. Fold right-sides together lengthwise and press. Stitch 1/4" from the raw edge down the length of your piece. Then turn right side out and press again, now you've got your tube for d-ring loops. Cut into 6 pieces approximately 3-4" long. Next, cut out a 3"x3" square from each bottom corner. 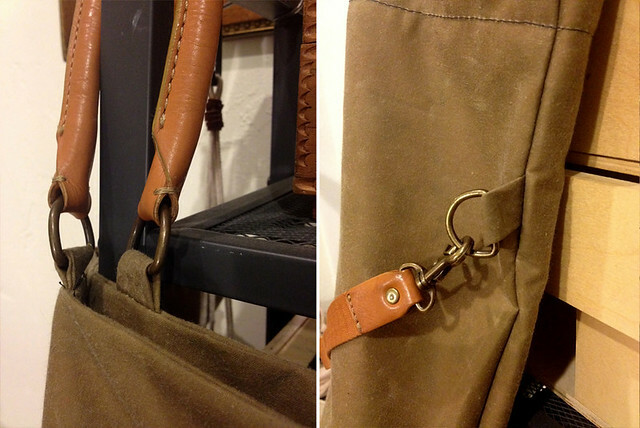 This will provide your bag's depth (or bottom). Pinch the cut out so that the two cut lengths are together - it should start resembling a bag bottom at this point. Stitch or serge this combined raw edge. That's it - those are the elements and construction of the bag. I'll add, I've been traveling with this bag now for about 5 months - I love it. This is awesome. 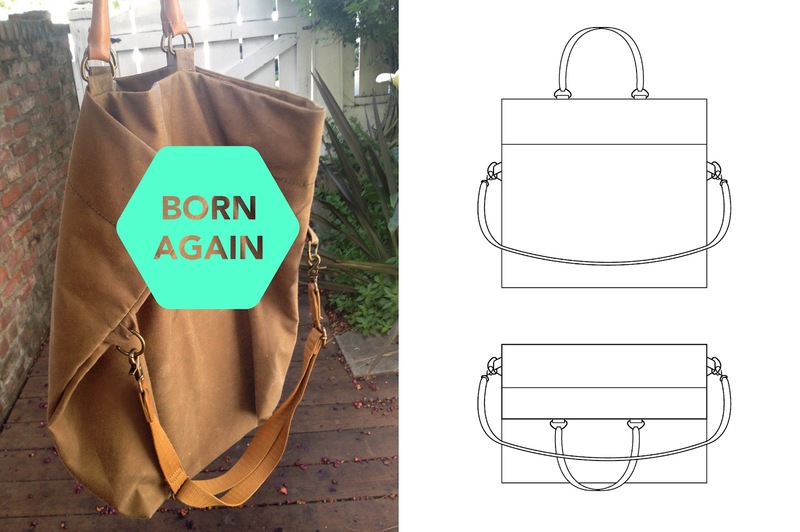 Thank you for taking the time to illustrate and explain your process of making the perfect shoulder/messenger canvas bag. Going to try it soon, once I get all the metal parts and leather! Great tutorial! Thanks for all the diagrams. Looks great! And the tutorial is so detailed, Thanks for sharing!